We have entered into the month of October in which the Church encourages the faithful to have special devotion to the powerful prayer of Rosary – powerful because, we are repeating the Word of God and meditating on the various events in the life of Jesus and Mother Mary. Rosary is both vocal prayer and meditation. In many apparitions Mother Mary has encouraged us to pray the Rosary devoutly so that we will have the strength to overcome temptations. 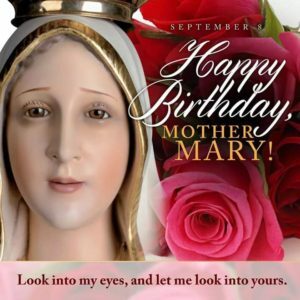 In one of her apparitions she said: “Mothers, recite the Rosary. It is such a powerful weapon for saving your children and bringing them all to heaven”. Once Mother Theresa was at the airport. Checking for emigration was going on. They were asking the passengers whether they possess any weapons with them. Mother Theresa was in the queue and her turn came. Very politely the staff asked her the same question. She too said politely: “Yes, I have”. The staff said, “Take it out”. She took out her Bible and Rosary and said: “these are my weapons”. 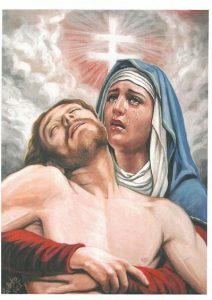 It was in the Tradition of the Church to honor our Lady of sorrows. The devotion to the seven sorrows of Our Lady has its roots in the Bible. 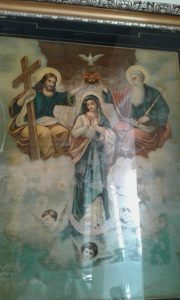 When baby Jesus was taken to the church by Mother Mary and St. Joseph, Simeon said to Mother Mary: “This child will be a sign that will be opposed…..and a sword will pierce your own soul also” (Lk. 2. 34,35). As Mary stood at the foot of the Cross of Jesus, the sword of sorrow which Simeon had foretold did really pierce through her heart. The devotion to Our Lady of Seven Sorrows (dolors) was passed on by St. Bridget (1303- 1373). Pope Pius VII, in 1817 extended this Feast of Our Lady of Sorrows to the universal Church. In 1913, Pope Pius X fixed the date on September 15. The Blessed Virgin Mary grants seven graces to the souls who honor her daily by praying seven Hail Mary’s and meditating on her seven sorrows. The following are the seven swords that pierced her heart. The Lady of Seven Sorrows is the Patron of Slovakia. 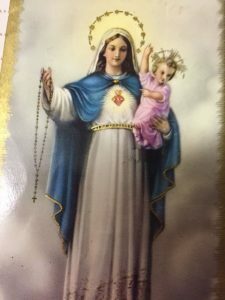 As we honor our Mother with this devotion, let us also make up in our lives whatever is lacking in the sufferings of Christ for the good of the Church, which is the Body of Christ (Col.1.24). May all the sufferings of the persecuted Church be united with the sufferings of Jesus and of the sorrows of His Mother in producing fruits of Redemption for many. Let us pray: ‘Holy Mother, pierce me through in my heart, each wound renew of my Saviour Crucified’. When we stand for the truth, the powerful will try to suppress or even punish us as John the Baptist was treated. He spoke out the truth that it was wrong for Herod to marry Herodias, his brother’s wife. 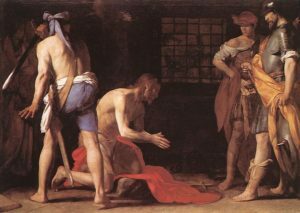 When John the Baptist obeyed God, man turned against him and killed him. This is what will happen to people who obey God because nowadays we are living in a Godless society. Please listen the Audio in page Media for the homily of Fr. James Mariakumar. 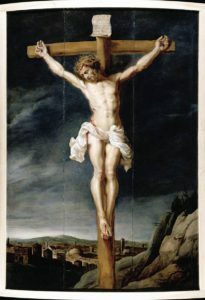 It is fitting that the Holy God, who has become man and suffered the worst form of suffering, be raised by the Father to be the Perfect Man in heaven. God ‘prepared a body for His Son’ (Heb. 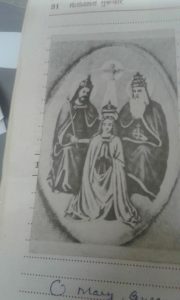 10.5) in order to come into the world through the Immaculate Virgin (Gen. 3.15, Is. 7.14, Gal. 4.4). She was conceived without original sin, and cooperating with the grace of God, she lived a sinless life. So it is fitting that the Mother of Jesus, the Word Incarnate, who partook in His salvific mission, should be raised to heaven, body and soul. It was God’s plan that through conversion, faith and living of our Baptism we become the members of the Body of Christ (Col. 1.24) and children of Mother Mary assumed into heaven. She draws us to share Her own glory. It is our Vocation and Mission to live in such a way that we become worthy of being Her children so as to share Her glory in heaven. “We know that the whole creation has been groaning as in the pangs of child birth even until now. Not creation alone, but we ourselves, who have the first fruit of the Spirit groan in our innermost being, eagerly awaiting the day when God will adapt us as sons, the redemption of our bodies. For in this hope we were saved” (Rom. 8.22-24). Let us rejoice in the Lord and celebrate this feast in honour of the Virgin Mary, at whose assumption the angels rejoice, giving praise to the Son of God. Mary, the well beloved Daughter of the Heavenly Father, the tender Mother of His Son Jesus and the Most Beloved of the Holy Spirit, please pray for India as she celebrates the 70th year of her Independence today. May we all aspire for the true freedom of the children of God. The song of Rabidranath Tagore: “Into that heaven of freedom, my Father let my country awake” be the song of prayer arising from the heart of every citizen of India.